With more than 1 million copies in print, the original edition of Care of the Soul is a remarkable study of the creative opportunities that are available to us in everyday life. Thomas Moore is now a world-renowned writer, psychotherapist, and speaker, and this new, illustrated edition of Care of the Soul brings an edited version of the original text to a new audience. 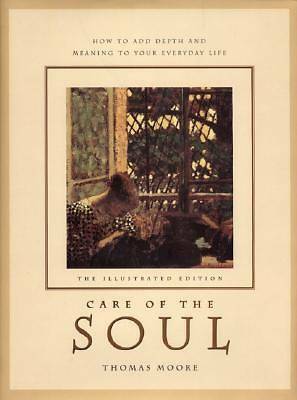 Care of the Soul: The Illustrated Edition offers a therapeutic program to restore the spiritual life to the human soul. We are given the opportunity to go deeper into our emotional problems and find the sacredness in ordinary, everyday life -- with friends, in our conversation with others, in more fulfilling work, and in all the experiences that can touch the heart. By integrating classical and modern art with the text, this edition offers the reader the opportunity to envision the already very visual nature of Thomas Moore's writing. It contains more than 150 color illustrations of great works of art that make the text come alive -- ranging from pieces by Marsilio Ficino, one of the author's favorite artists, to Edward Munch and Pablo Picasso; from vase paintings created in 400 BCE all the way to works by modern artists such as Edwin Romanzo Elmer, Giorgio De Chirico, and William Waterhouse. Thomas Moore has long worked as an art therapist and has studied religion and music -- all of which have come together in this volume to bring us an extraordinary and inspirational guide to the spiritual solutions needed in daily life.